Set at 9,500 feet in southwestern Colorado's magnificent San Juan Mountains, the hotel rises above the pines in Telluride's Mountain Village just below ski slopes and adjacent to the Telluride Ski and Golf Club. Its location and height afford all of its rooms and suites with the spectacular views—none more so than the two- and four-bedroom penthouses on the 7th, 8th, and 9th floors. Location aside, its salient amenity is its 42,000-square-foot rejuvenating spa, the largest in Colorado, which encompasses 32 treatment rooms and a two-story fitness center. The lure in general is the recreation Telluride affords—skiing in winter; hiking, fishing, mountain biking, whitewater rafting in summer. And the Peaks supplements those summer offerings with access to golf and its own complex of five hard tennis courts. And the town of Telluride goes even farther, luring the June-early September visitors by staging festivals—film, bluegrass, blues, playwrights, wine, chamber music— and concerts throughout warm weather months, so that there is scarcely a summer day without some sort of entertainment or special activity. Overseeing the five hard courts and two paddleball courts is Philadelphia-born Bill Austin, a USPTA-certified pro who played No. 1 singles and doubles for the University of South Carolina. Since arriving in 2012, he has beefed up the weekly programming, most notably by staging a drop-in clinic every weekday morning. "I try to make it user-friendly," " he told me. "No one has to sign up in advance. They can just drop by." 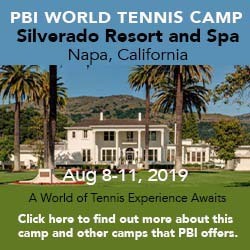 He follows that clinic with one for juniors and then spices the summer calendar by bringing in visiting pros—often accompanied by some of their club members—and staging periodic tournaments and a weekly Sunday morning doubles or mixed doubles round robin. He's also found that the paddleball courts are also ideal for pickleball, and has introduced that to hotel guests and members alike. And beyond that he also offers private lessons. Courts & Fees. There are five courts and two paddleball courts, which double as pickleball courts. Fees: None, though you must be a member to use the courts ($50/week, which includes discounts on clinics and social events). Lodging in the main hotel consists of 168 rooms and suites, 14 penthouse condominiums, and 30 fully equipped 2-to-5-bedroom mountain cabins. Palmyra Restaurant, located just steps from the courts, focuses on regional cuisine and locally harvested ingredients. There's also an espresso/pastry/light fare shop called Steaming Bean and, in summer, the Deep End Pool Bar. Lodging options include from rooms, suites, penthouses,and cabins, the last as large as four bedrooms. Rates vary seasonally. Seasons. The tennis season runs from June into September. Travel Instructions. By Air: The Peaks is 6 miles from Telluride Regional Airport (TEX), though more frequent service is available by flying into Montrose Regional Airport (MTJ), 65 miles to the north. General Tourist Information. For information about summer in Telluride, visit the Telluride Tourism Board website. For general information about vacationing in Colorado, visit the Colorado Tourism website. So far, I haven't received any written feedback on Peaks Resort & Spa. If you've taken a tennis vacation there, I'd like to hear your reactions.